When we examine life's many structures whether they be a token group, a large organization, a physical object, a written sentence or even the small thoughts in our mind we see that the supporting framework is what gives them strength and stability. Often we feel that our everyday tasks are timed by an invisible clock that spontaneously establishes our daily relevance. Now life is dependent upon our ability to meet the many predetermined deadlines. Profitability, functionality and marketability of preliminary plans and product development are now the only essential factors considered.
" our daily lives. Everyday life is a myriad of electronic home and office appliances, personal communication gadgets and a million other options at small, large and humongous retail markets that indulge our every wall outlet. In many instances medical devices keeping humans functioning are plugged into machines and monitored by robotic type electronic sensors. 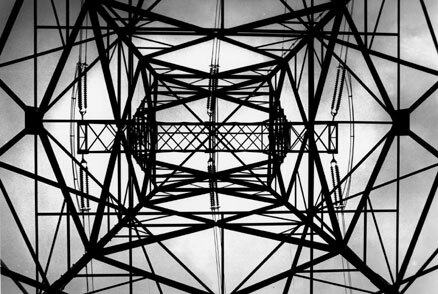 When standing underneath a typical high tension tower we become aware of the complex support structures a digitally enhanced existence requires.